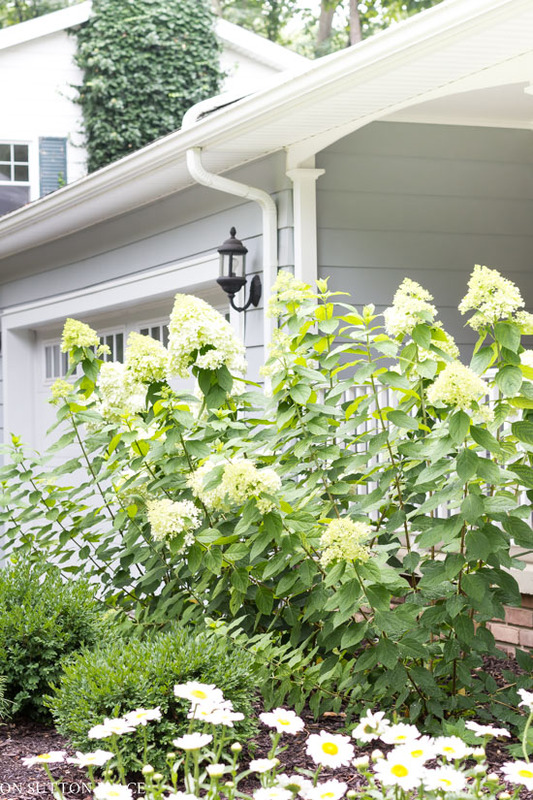 In this post: A limelight hydrangea care update. 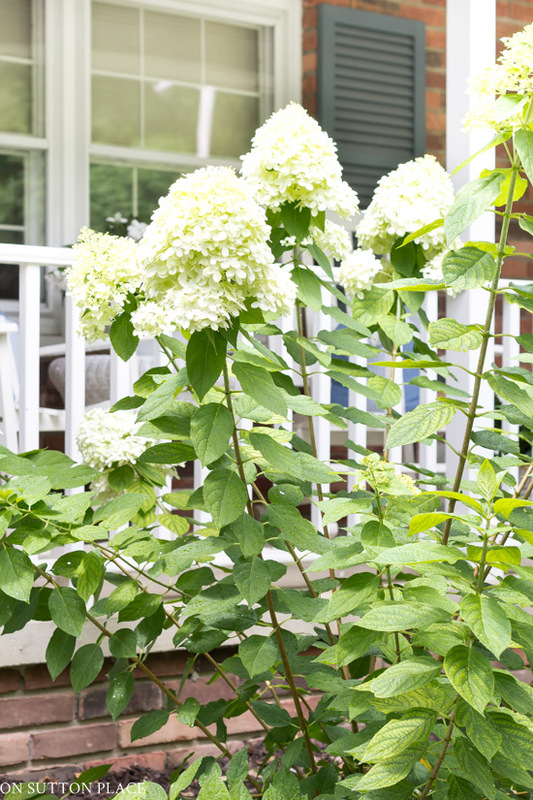 Hard pruning information & easy tips for growing large limelight hydrangea flowers, plus a limelight hydrangea centerpiece. My gardening career has seen its share of ups and downs. I’ve said many times that I have had more failures than successes, but I keep plugging away. I’ve had several questions about the state of my limelight hydrangea bushes, so I thought I would give you all an update. Before I get to the update, we need to go back to last summer. By early September, all the stems of my limelight hydrangea bushes were laying on the ground. The blooms were just too heavy and big for the stems to hold them upright. I researched and asked my garden blogger friends, but there was no definitive answer as to how to solve the problem. One of my friends said that it could very well be a glitch in the cultivar, and they will always have blooms that the stems cannot support. I am not an expert, but that comment made the most sense to me. 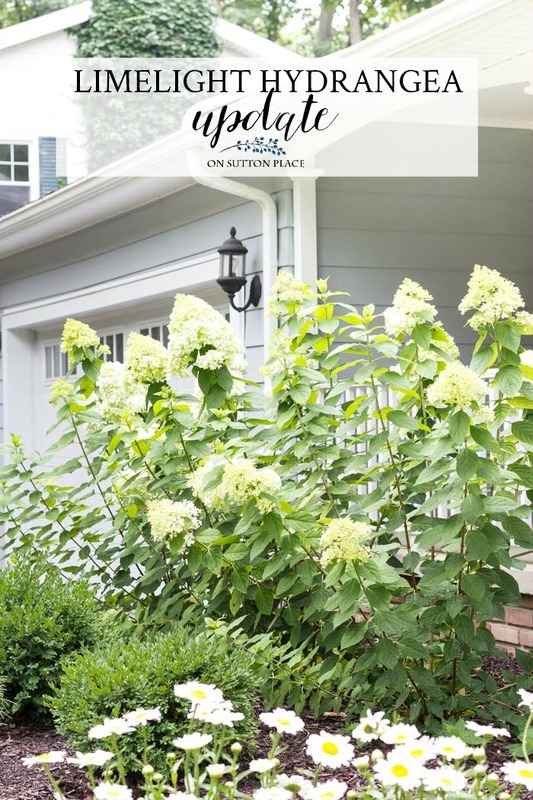 So by late September, I had to make a decision and plan my limelight hydrangea care. I felt I had three choices. I could leave the limelight hydrangea bushes alone and hope for the best. I could lightly prune the blooms. I could hard prune them so new stems would emerge that would hopefully be stronger. I chose the third option and cut the limelight hydrangea bushes back almost to the root. I had no idea if I was making the right choice, but it made no sense to let the stems lie on the ground all winter and possibly rot. Like many times in my gardening career, I took a chance and was prepared to face the disappointment if I made the wrong choice. Thankfully, I can now say that cutting back the limelight hydrangea bushes was the right thing to do. The blooms are still huge and heavy, but the majority of them are standing tall. A few thinner stems around the bottom have fallen over, but that’s understandable…and frankly, I think it’s just something I will have to live with. I do wish the bushes would fill out. I’d rather that they be shorter and full instead of tall and skinny. Maybe next year! Getting limelight hydrangea bushes to bloom has never been a problem for me. I fertilize them with Jack’s in the early spring and without fail, by late July, I have massive blooms. For the first time in my life, I have these gorgeous limelight hydrangea flowers and I am so grateful. But they also make me a little sad, because I feel like the bushes are struggling under the weight of the blooms. I am definitely hanging in there with these bushes and have no plans to replace them. I like a challenge, and maybe I’ll get this weak stem issue figured out some day. If anyone has advice or words of wisdom, please leave a comment. I would love to hear from you! I didn’t want to cut all the blooms from the limelight hydrangea bushes, but I couldn’t resist cutting a few. I chose some that were fresh and white, along with a few that were beginning to dry. I used my bargain ironstone tureen and put the arrangement together using this method. The limelight hydrangea flowers were heavy, but with a little adjusting, I was able to get them to settle into the tureen. I thought the arrangement needed a little height and had my heart set on eucalyptus…but of course I couldn’t find any that was fresh. I opted for some faux eucalyptus that I got at Hobby Lobby and I think it looks almost real. You’ll be seeing it again in some of my fall decor. Speaking of fall, this may be my last summer decor post for the year. Don’t get me wrong…I’m not ready for summer to be over just yet. We do need to move forward and plan ahead just a little…but savor these last few weeks of summer! Maybe a peony support would help. They are round with a lattice framework on the inside of the ring. I made mine from the largest section of a tomato cage. Cut the top two smaller ring off and wove wire inside for the grid. Those stems growing outside were tied to the ring. The support disappears behind the leaves but hold the stems upright! Your Limelight’s are beautiful! 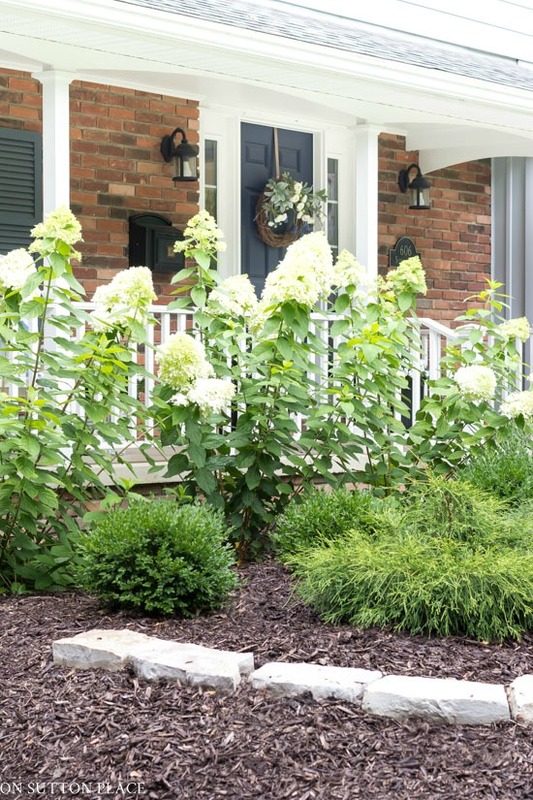 Call me nuts or crazy, but at the beginning of July my husband and I bought three large Limelight Hydrangea plants and planted them in our front yard. I live in a suburb of Portland Oregon and in summer we are in the high 90’s to 100 till nearly mid September. These poor flowers have had there share of direct sun and heat. We have been watering them 3x a day and my husband got creative and made large umbrella shades we have been using in the middle of the day. Most of the flowers are standing tall but one plant was struggling with the flowers falling down to the ground. We staked them and tied them up to help support them. This hasn’t hurt the plant one bit! We also had to stake our Crepe Myrtle she started tipping from the front and side. So far so good. I can’t wait to see how these plants do next year. I love my hydrangeas and have several different kinds in the back yard. I read your posts Ann and feel you are a top notch decorator and gardener. I have really learned a lot. Thank you for all the beautiful work you do and share with us! Can’t hardly wait to see your Fall posts!! Ann…my suggestion for next year is to not do the hard prune to the ground. I have found that you prune about two thirds of the way down when the plant is still dormant before it produces buds. The old wood is what gives your plant the shape and structure and strength to hold the new growth that produces the flowers. Your plant will become taller so this may not work for your site. I hope you give this approach a try next year. Hi Joan…that’s exactly what I’m going to do. I’m not going to hard prune this year for sure! 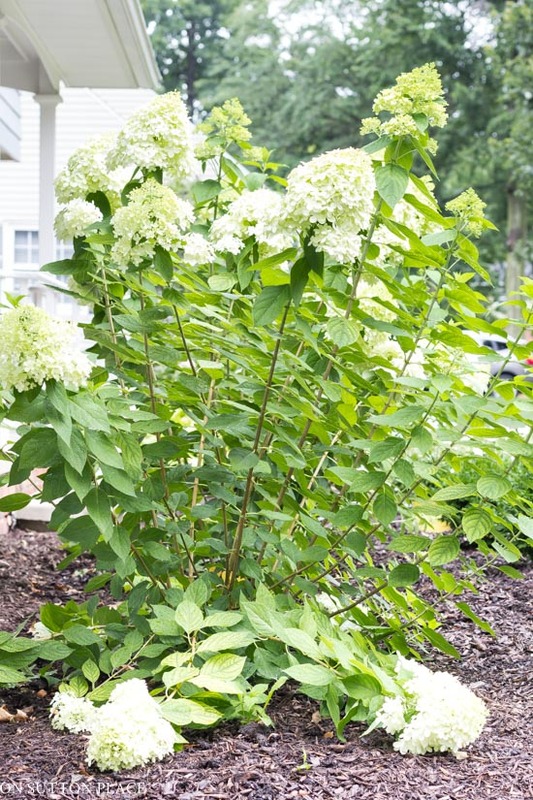 In regard to the Limelights falling over from the weight of the blossoms, plant Annabelle hydrangeas in lieu of Limelights. The blooms are more rounded and are not quite as heavy as Limelight blossoms. In addition, the Annabelles dry beautifully when they start to turn green. I prune them back every late fall to almost the ground and they return more beautiful than ever. If I can’t get these limelights strong enough I may have to take them out and plant Annabelles. I love them too! Delightful post as I too am having trouble with my hydrangea plants. Outside. It has been if’y but, doing well this year and with luck next year they will be even better. New to your Blog and can’t get enough! I bought the Little Limes (smaller version of Limelights) and they are also a bit weak stemed but beautifully full with flowers. I thought it was just because this is their first year in the ground. 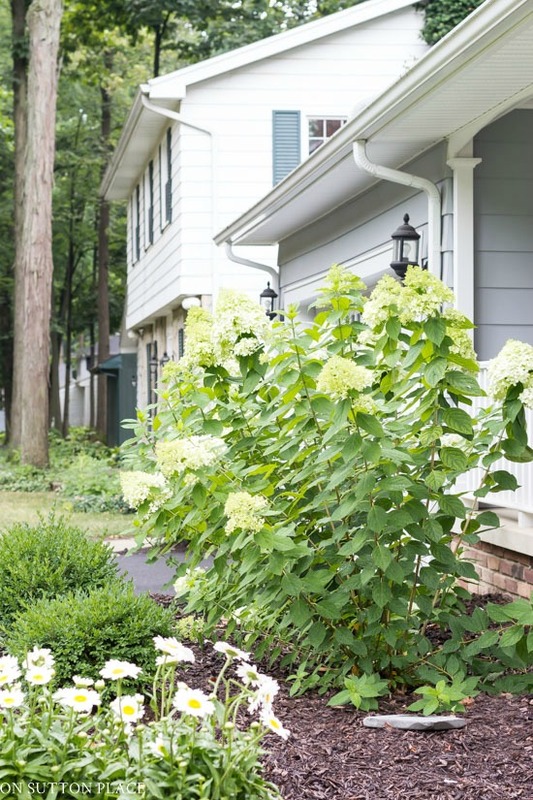 Thanks for sharing about your limelight hydrangeas. I have had the same dilemma as I would prefer shorter and fuller bushes. I am pretty radical when pruning my bushes…. maybe it will take a few years for the bush to develop stronger stems. Let’s hope so!!! I also have many limelight bushes and they look just like yours; the lower stems lying on the ground. It is disappointing to see them lying there instead of looking perky and beautiful. I am going to try pruning them as you did and see what happen. Thanks for the post. For the naked ladies growing in my yard. My hubby loosely secured them with fishing line. It is invisible to the eye and gives good support when attached to the railing. I enjoy your posts . Check out Garden Answer on Facebook. I was friends with this young gal’s mother and we ended up having babies on the same day. Laura is a delight, raised in a gardening family, and a wonderful Christian woman who loves gardening. She worked at the garden center where her parents are part owners and I visited frequently before we moved. It has been so exciting to see her “bloom” and grow in her own career. She just did a post about hydrangeas. Enjoy! My limelights are at least 10 inches across. Every spring I cut them way back to about 2 inches. I never fertilize, too lazy, but they come back every year. When they get about 15 inches from the ground, I coral them and tie them in a hugh bundle so they won’t fall because they do get heavy, especially after it rains. Ann, your table centrepiece is so beautiful! Beautiful arrangement of flowers, Ann. I hate to cut my hydrangeas too since I have only one bush. Your centerpiece is lovely with the white ironstone urn. Gorgeous Ann, I believe that cutting back is the right thing to do to strengthen the plant and encourage it to fill out. 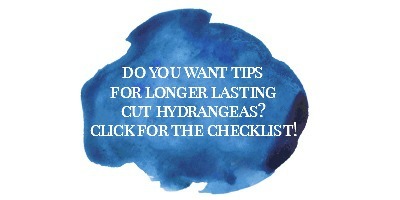 Any blog post that has the word “hydrangea” in it draws my attention. I’ve noticed that my endless summer hydrangea is kinda laying on the ground too. You were brave to cut the plant all the way to the ground. It is a very pretty plant with pretty blooms. I think hydrangeas rival roses as garden favorites. I like the addition of the faux eucalyptus to your arrangement. I love limelight hydrangeas and planted a couple of bushes about three years ago. They looked great the first year, but we haven’t had any blooms this year at all. We also have another variety that leafs out every year but never blooms. I will try the Jack’s fertilizer next spring. Which formula do you use, the 20-20-20, or the 10-30-20? I am so envious of everyone’s hydrangeas this time of year. We have had such bad luck growing them, but I’m not ready to give up! 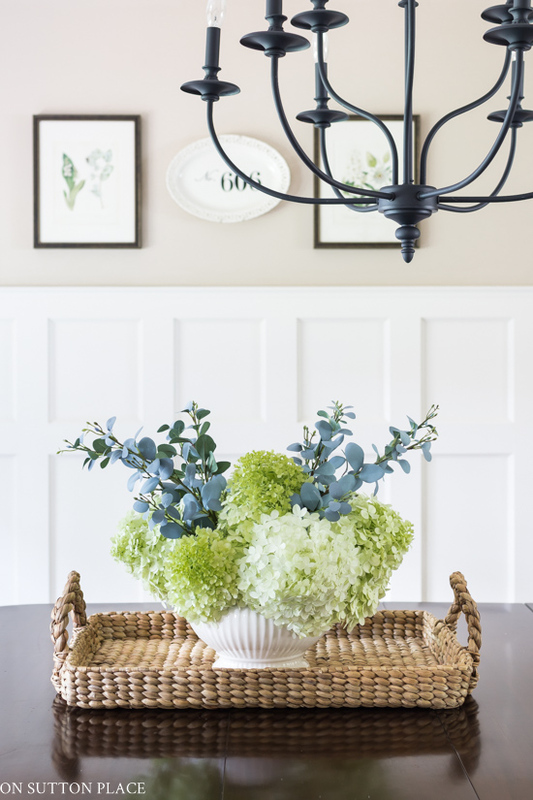 The arrangement is beautiful, hydrangeas are one of my favorite flowers.Enjoy those blooms ! Ann, that arrangement is gorgeous! 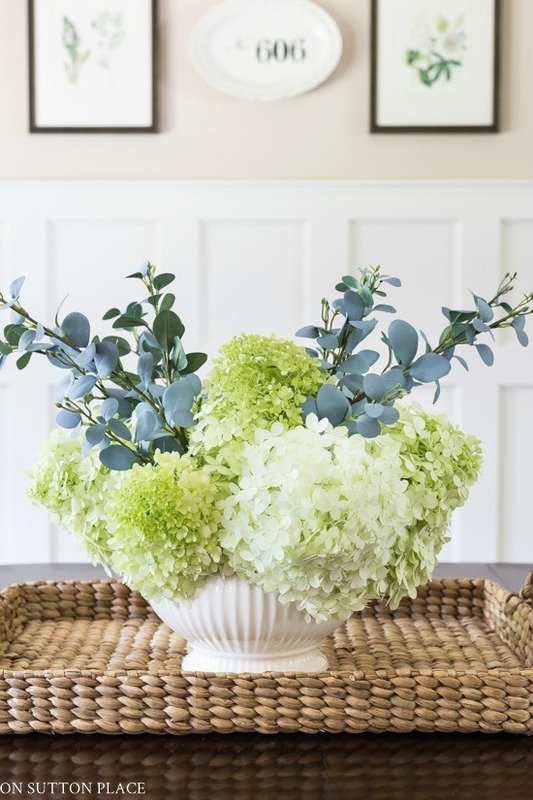 The eucalyptus looks almost bluish and paired with the limelight color of those immense hydrangeas, it’s a perfect combination. Good luck with your bushes. I know nothing about hydrangeas but from the look of things, I’d say you made the right decision. Have a blessed day! I planted a Little Limelight hydrangea last summer. I, too, cut it way back in early fall. It was the right decision. It grew back full and has been loaded with blooms all summer. Love your centerpiece! Hi Missi…I cut them all the way back last fall after the blooms had all dried. It was probably late September or early October. Do you have any tips for decorating small spaces or ideas on how to make a rental feel more like home? Hi Ann, I have had the same issue with my Limelight’s. I wasn’t sure what to do this year, but my landscaper solved my question. He accidentally trimmed them to half their size. Unfortunately I only have a few small flowers this summer. I am hoping next years plants will be much stronger. Enjoy the rest of your summer! I am going to try this and see what happens! Hi Ann! I planted 2 limelight hydrangea plants several years ago, one next to my shed & the other in my garden. I used a large tomato wire cage to help support the one in the garden and that has been helpful. The one next to my shed is getting large (over 6’) and it took several years for them both to get established and bloom. These are one my favorite flowers along with peonies! Yours are stunning! Are there any garden frames or stakes you could use to support the hydrangeas ? Maybe you could place bamboo stakes and tie with green or natural jute twine. I have used twine to tie the stems together. The stakes are a good idea too! They make a wire plant support ring that has legs that push into the dirt that could be used for supporting the stems. A little pricey.. Alternative – use a wire tomato cage cut to length you desire. I’m glad that worked for you to cut them back hard, Ann – I do think they look wonderful this year! I had really good luck with the smaller version of Limelight, ‘Little Lime.’ It did eventually get too big for that space (it’s not as dwarf as I thought, lol), but it topped out at about 5 ft (vs. Limelight’s 8 ft) and was always full and held the stems upright. The smaller blossoms were at the bottom, so they didn’t flop over as much unless we had a lot of rain. I pruned each year to about 2-3 ft. I hope to plant it again in our new farmhouse – somewhere the deer can’t get it, ha! Your limelight’s are beautiful Ann….& the arrangement as well..Wish I had room to grow them! Those blooms are beautiful! I don’t know anything about hydrangeas, except that I love them. I live in a desert so while they would only do well here in the shade and heavy water, I haven’t tried growing them. Your eucalyptus looked familiar and now I see why. I got the same sprigs from hobby lobby 2 weeks ago for some faux arrangements I made. They look incredibly realistic. They look stunning with your blooms! This is about the falling over hydrangea bushes. Tie them up! Get a stake from you favorite garden canter, pound it into the ground behind the plant and get some string or what ever and tie around the whole bush. Too late for this year but maybe next time.